If you have your own internet domain name, you may have come across the Domain Registry of America (DROA), also known as the Domain Renewal Group. They’re a bunch of scammers who regularly and repeatedly send out letters which look like an invoice for a domain name, but are in fact custom advertisements for overpriced online services. If you blindly follow the form and send them money, you’ll transfer your domain name over to their registry, and pay a handsome amount for doing so — almost certainly more than you were already paying. Their carefully worded FAQ (which is similar to the letters) tries to make out that at US$30/A$45 per year, they are cheap. They’re not. 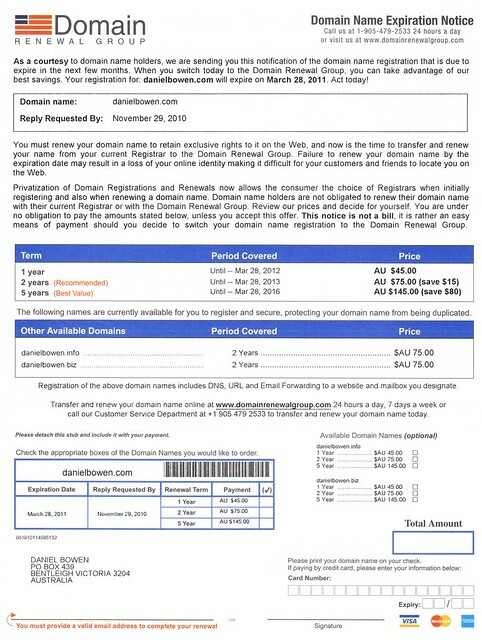 There are any number of domain registrars that will register a .com domain name for around US$10 (at the moment about A$10) per year — or even less. So you might as well just chuck any letter from DROA into the bin. Or, I pondered, could you go and harass them in person? 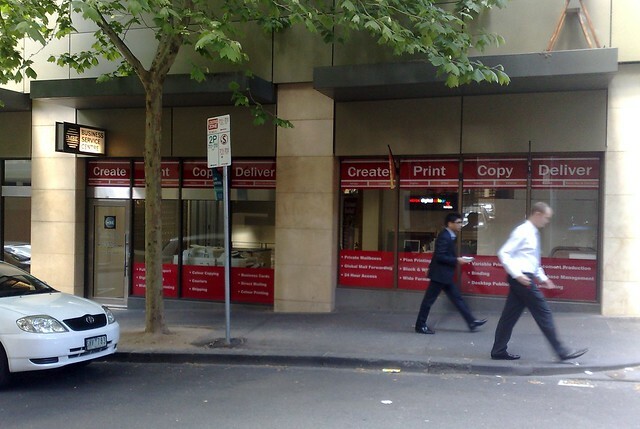 You see, I noticed one of their offices is here in Melbourne: “189 Queen Street #209” — that’s US-speak for “unit 209”. So I went along to see if I could find it. I had a good look around, and couldn’t actually find number 189. There is an optometrist, which is supposedly 185-191. 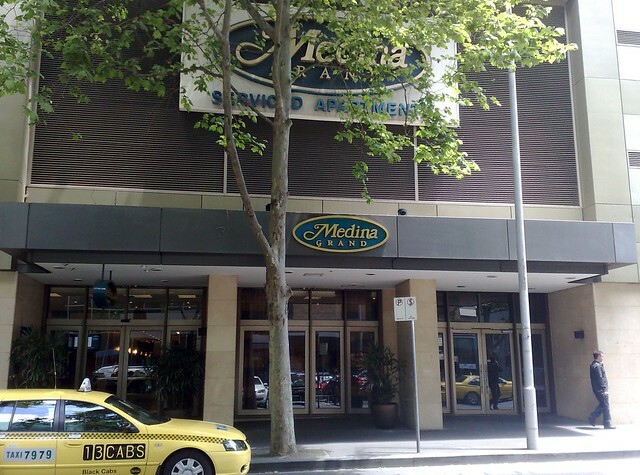 Next door to that is a Medina Serviced Apartments building, with no street number on it. I thought this might be number 189 (I checked later and found that it is indeed) so I went and looked inside. According to the list in the lift, there is no unit 209. There’s not even a level 2, unit 9 — levels 2-5 are the carpark. So it doesn’t seem to be there. 185-191 is on a corner. I checked around the corner (in Little Bourke Street) for another entrance. I didn’t find one, but it’s notable there there’s a business centre there, though it has a Little Bourke Street number. Peeking inside the window, I did note that their letterboxes are numbered from 201, and there is a 209. I wonder if that’s them? Looks like it — a commenter here reckons he was directed from the Medina to the business centre. So, 189 Queen Street #209 clearly doesn’t exist. Which is no surprise really — like I said, the whole thing’s a scam. you should join the Myth-busters team! Excellent detective work. With the dollar so good I’ve been re-registering my domains for 5 years each if they are due. Well worth not having to worry about it for a while. I wonder what they would say if you emailed them that you tried to visit their Melbourne office but could not find it. I forget how many floors it is, but the notice inside the lift lists the specific unit numbers, and which floors they are on. There is no unit 209. If they’re operating from within Australia and supposedly have an Australian business address, shouldn’t they have an ABN/ACN or some such? Might be another avenue to pursue in tracking them down to report them. I did a quick search and couldn’t find an ABN/ACN. Arrrrggggg. I got scammed. It wasn’t until I got an email with all these conditions attached that I decided to look these guys up. They were talking about “transferring” all my details over to them. I thought why do I have to transfer anything. I paid $60 to get two years, which now means nothing. I have cancelled by bank card and have to put a dispute letter to my bank. The money isn’t a big deal, but knowing I fell to a scammer. The dent to my ego might need a little panel beating as I work in an area the at times helps people who have been victims of such scams. Thanks for you website. I looked up the address online, and found it didn’t exist. The money is all being sent to Canada. And I love Canadians. Don’t worry, I could never hold anything against a country that gave us Degrassi Junior High. Though Celine Dion is unforgivable. Good on you for sharing this here, Dave. Sorry you got burnt. I contacted them, as said as no services were rendered and I don’t authorise any of my information to be transferred to their holding company, I want a refund. Much to my surprise, they refunded my money. It was stressful, and at the start they were not helpful, but eventually gave it back. I would recommend staying clear of these folks.